Home » Frequently Asked Questions » Can I Get Fired for Filing a WC Claim? Can I Get Fired for Filing a WC Claim? Can I Get Fired if I Pursue Workers’ Compensation Benefits? Because Georgia is an “at will” employment State, your employer can fire you for pretty much any reason. My experience has been that if your employer decides to terminate you, the reason will have more to do with its desire to avoid “damaged goods” as opposed to retaliating against you in particular. Statistically, a worker who has injured his back, knee, wrist, elbow or other significant body part is more likely to re-injure that body part in the future. Most businesses, especially in manufacturing, construction and other labor industries want fully staffed shifts of healthy workers. If you are injured and have to miss work, your employer may have to bring in temporary workers or run a shift short of personnel. Since your return to work is unknown, and you may be released to light duty, your employer may decide that it is easier to terminate your employment on the grounds that you are not able to perform the tasks of your job. In terms of case strategy, your termination may benefit your workers’ compensation claim. One of the tactics used by insurance companies to terminate benefits is to create a “light duty” job, place the injured worker at that job, get a “full duty” release, then terminate the employee. If the employee was terminated early on, then the insurance company will not have the option of returning you to an actual light duty job with your employer. I know that my clients are very concerned about job security. However, I think it can be wishful thinking to assume that an insurance adjuster will have your interests at heart, or that you will somehow be treated differently or better because you did not make waves. I have seen far too many cases in which an injured worker who wanted to be “cooperative” called me 8, 10 or more months into a case, when his benefits and medical care was cut off. I encourage you not to put yourself in this position. 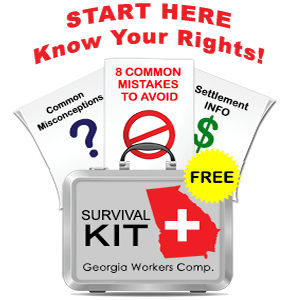 Although it was not designed this way, the Georgia workers’ compensation system has become very adversarial. If your case is substantial, and you are able to settle for significant money, the employer and the insurance company will require you to resign anyway. I am happy to speak with you about your work injury and about the pros and cons of pursuing a claim and hiring a lawyer. My telephone number is 770-351-0801 or you can reach me by email using this email form.